Durham Bull, originally uploaded by needlepointernc. “Durham was nicknamed the “Bull City” in the late 1800s when the Blackwell Tobacco Company named its product “Bull” Durham Tobacco. By the time James B. Duke of the American Tobacco Company purchased the Blackwell Tobacco Company in 1898, Bull Durham was the most famous trademark in the world. 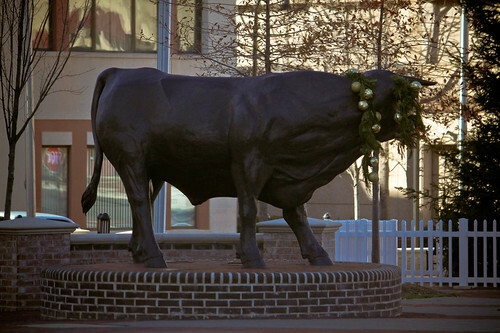 The “Bull City” prospered as a manufacturing hub for the tobacco industry and textiles for many decades, but has since transformed itself into a place where shopping thrives and high-tech industry flourishes with upscale housing in the same classic buildings where tobacco giants American Tobacco and Liggett-Meyers once made this City their industrial home. With the birth of the Research Triangle Park (RTP) in the 1950s, Durham began to take on a new look that has evolved into a global center for information technology, biotechnology, pharmaceuticals, and medicine. The City of Durham is known as the “City of Medicine,” with healthcare as a major industry including more than 300 medical and health-related companies and medical practices with a combined payroll exceeding $1.5 billion annually.